Kim Stanley Robinson's The Years of Rice and Salt is distinctly Robinsonian, mostly in good (nay, excellent) ways. Much like his Mars trilogy, this novel traces the development of a civilization over the course of centuries. So, there is an epic sweep to it, but the focus is not the traditional kings & wars narrative of epic fantasies. As in the Mars trilogy, the focus is an inter-generational development of social systems, especially with regards to figuring out and socially constructing man's relationship with fellow man and man's relationship with nature. This time, the milieu is that of an Earth in which the Black Death killed off even more people, so much so that Western civilization utterly collapsed. In the wake of this catastrophe, the world evolves into one dominated by three major civilizations: Dar al-Islam (the various polities derived from the Islamic conquests of the Middle Ages), India, and China. The historian in me thrilled not only at the possibilities that such an event could have, but also at Robinson's handling of the consequences all the way from the 14th century up to the 21st century. The scope is breathtaking, and the sum of all the minutiae spinning out of this super-Black Death makes one appreciate the sheer fundamentality of Western systems of thought in the modern world. Almost every time I went to bed after having read a few chapters of this novel, my head was swimming. Now, you might be wondering whether such a novel can have any traditional kinds of character development, given its centuries-long scope. Well, no -- not traditional, anyway. Both Buddhism and Sufism (a sect of Islam) have well-defined ideas about reincarnation. 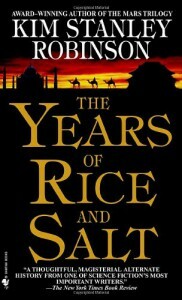 The Years of Rice and Salt follows the path of a soul trying to find enlightenment across the centuries. He starts out as a Mongol "warrior" encountering an empty Europe in the late 14th century, and he (sometimes she) inhabits different bodies in different places and times. There is much about reincarnation that I am not familiar with (having come from a decidedly Protestant Christian tradition myself), but the theology of it underpins the narrative of the novel and heavily influences the historical traditions that it situates itself in. There are even scenes in the bardo (a kind of limbo where souls are judged and assigned their next incarnation), and I feel that these are crucial for an understanding of the novel, although I don't feel competent to explain them. They are spaces in which the soul reflects on its progress toward enlightenment (and sometimes its failure to progress). These bardo scenes also serve as spiritual responses to the material "progress" of human civilization. Just as in our world, this novel's human civilization advances in technology and engages in all the wonders and horrors that human beings are capable of, just not in exactly the same order or at exactly the same time. As is Robinson's wont, our point-of-view characters are thoughtful, and many of them philosophize at length on historical processes and intellectual trends in history. There was a lot of this in the Mars trilogy, and it's here too in just about the same proportion (which is to say, there are historical/religious/philosophical expositions/speculations that go on for pages at a time, interspersed at about one per 50 pages or so, on average). This will not be to everyone's taste, and moreover, Robinson is unashamedly political -- he always comes down on the side of social justice, egalitarian government, and environmental accommodation. 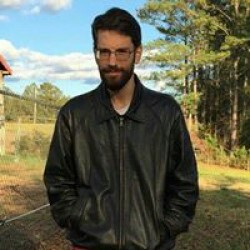 So, I suspect that right-wing readers (with the possible exception of libertarians) will want to avoid KSR's work as a whole if they don't want to read outside their ideology; and even right-of-center readers may have bones to pick. That said, I think that any reader interested in history, anthropology, and/or science will find this novel fascinating just for the alt-historical possibilities. And if you're even a bit left-of-center, you're going to find a few things to cheer for. Next up: selections from Piers Plowman, from the Norton Anthology of English Literature.